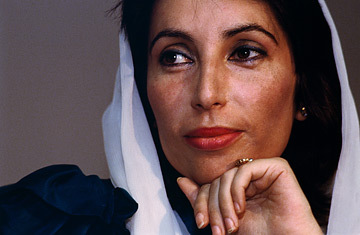 Where Bhutto's Death Leaves the U.S.
Benazir Bhutto excelled at asserting her right to rule. In a male-dominated, Islamic society, she rose to become her slain father's political successor, twice getting elected as Prime Minister of Pakistan. She would also be exiled twice. In the end, Bhutto was better at rallying people to the idea of her power than at keeping them inspired by her use of it. She was a child of privilege, and took the mantle of power from her father Zulfikar Ali Bhutto, the fiery and magnetic founder of the Pakistan People's Party, who himself would become a martyr for democracy when he was executed in 1979 by the military dictatorship of General Zia ul Haq. She inherited her bearing and physical presence from her mother Nusrat Ispahan, from a distinguished Kurdish family from Iran. Educated at Radcliffe and Harvard, she would also study law at Oxford. Her family and close Western friends knew her as "Pinky." As a Muslim woman leader, Bhutto was almost an iconic figure in the West. But her actual career in office was one of great populist spectacles and little governmental achievement. It was a personna she parlayed. "I am not one of those leaders who sell lies and buy time," she told TIME in the mid-1990s. "No leader, no dictator could do what I have done." However, in the final analysis, her career was an almost tawdry cycle of exile, house arrest, ascent into power and dismissal, much sound and fury and signifying little. Jailed and then exiled after her father's fall, Bhutto returned to campaign for office in 1986 after Zia's military government gave in to international pressure to slowly restore democracy. (Despite his dictatorship, Zia was a key ally of the West, supporting the Mujaheddin against the Soviet occupation of Afghanistan.) In a scene reminiscent of her second coming in October 2007, she was greeted in April 1986 by hundreds of thousands of frenzied supporters, who enveloped her motorcade and staged a daylong demonstration that was the largest display in memory of discontent with Zia's government. "Zia is a dog," chanted the demonstrators again and again. "We love Benazir." Zia's death in a plane crash in August 1988 helped to further loosen the military strictures around the country, and Bhutto became Prime Minister by December of that year. As a ruler, Bhutto got few favorable reviews in Pakistan. Her government passed no legislation except a budget during its first 14 months in power. Much of its energy was squandered feuding with the opposition. Among the first acts of Bhutto's party after coming to power was a campaign to bribe and threaten legislators in Punjab. The goal: to overthrow Bhutto's nemesis, Mian Nawaz Sharif, Punjab's chief minister, a wealthy industrialist and a close associate of Zia's. Worse yet, her Cabinet stank with corruption scandals, including allegations against her husband Asif Ali Zardari and her father-in-law Hakim Ali Zardari, who was chairman of the parliamentary public-accounts committee. With so much fractiousness and scandal, Bhutto's first government lasted only until August 1990, dismissed by the country's President for "horse-trading for personal gain." Soon after, in November 1990, Nawaz Sharif, campaigning on an anti-corruption platform, became Prime Minister. Bhutto returned to power in 1993, after Sharif was felled by his own corruption scandal. "This is my victory. It is a clear and decisive victory," she declared after a bitter name-calling campaign between herself and Sharif. But despite her claims, she did not have a working majority in parliament and had to wobble through her next few years in office as head of a fractious coalition, beholden to contentious blocs of power. At the same time, Pakistan owed huge amounts to the International Monetary Fund as part of servicing its enormous $28.6 billion in foreign debts. Bhutto had raised taxes, which raised the level of discontent in the country. But even so, her government did not collect enough revenue. In an effort to appease the IMF, Bhutto gave up the finance portfolio she had held since retaking the government. "The debt servicing is breaking our backs  debt that I didn't incur," she told TIME. "But as Prime Minister, I have to pay it back." Rumors soon spread that her government would be dismissed. "Rubbish," she said. But that is exactly what happened. Soon, Nawaz Sharif was Prime Minister again. Sharif himself would be overthrown in a coup by General Pervez Musharraf in 1999. Musharraf would become an indispensable ally of the U.S. after Sept. 11, 2001, when he became the guarantor of the stability of nuclear-armed Pakistan against the tide of Islamic radicalism. And that is where Bhutto's final chapter picks up  as the popularity of the Musharraf regime collapses and the world looks warily at the future of Pakistan and the threat of radicalism. In exile once again and with corruption charges against her, Bhutto struck a deal with Musharraf, who was under pressure to restore democracy. Washington smiled on it and Bhutto, now anointed as the West's favorite to restore democratic credibility to a moderate Pakistani government, returned to retake what she always believed was hers. Thousands showed up to welcome her and more than 100 died when that welcome-back parade was attacked by still unknown bombers. The last quarter of 2007 was filled with political maneuverings between herself, Musharraf and Nawaz Sharif, who had also returned from exile. After one more stint under house arrest while Musharraf imposed a brief emergency rule, she seemed set for another triumph at the polls. But in the end, the violent cycle of Pakistani politics claimed another victim. And once and for all, Benazir Bhutto will rally people to her cause without being able to deliver on its promise.